Automation/Functional testing jobs are high in demand of Software testing industries. Companies are looking for those candidates who have Automation testing skills like Selenium web driver, Cucumber, TestNG, Apache Maven, Git repository to import, export & share the project with your team members etc. Manual testers who are looking for change the career from Manual testing to Automation testing. IT candidates who are freshers and want to enter in Software testing industry. Non-IT candidates who want career change in IT. IT professionals who want to learn new skills/tools in Automation testing like Build creation with Maven, Continuous integration with Jenkins tool. along with leading Automation testing certification options. Apart from training, there will be separate InternshipOpportunity of getting experience with live projects during and after training as well as year-long JobSupportandguidance. If you have already completed training and want to brush up the Automation testing skills with Selenium web driver then our Mentorshipportal will help you to brush up your skills. 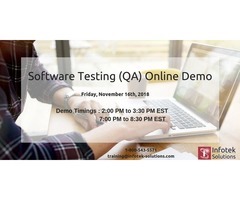 You will get various interview questions for various topics of Selenium Automation testing and placement related stuff like Resume preparation, job support guidance, etc.